Tidal Transit Kayak Company (207-633-7140, tidaltransit@hotmail.com) is located right next door to Back Bay Cottage, in the back of the green house with the Chowder House restaurant. They rent kayaks and bicycles and also organize ½-day and all day kayaking excursions that I highly recommend. They also offer a 4-day kids’ kayak camp in the summers. Please mention that you are staying next door at Back Bay Cottage and they will give you 10% off! See History of the Boothbay Region for some ideas if you want to learn more about the history of the region. Local photographer Robert Mitchell has graciously agreed to lead my guests on photography tours of the Boothbay Peninsula. Whether you are an experienced photographer, or just want to discover the best spots to take some nice shots to show everyone back at home, nothing compares to discovering (or re-discovering) a special place with a local guide. See my post for more details! Go out the front door and turn left past the Chowder House. Go through the parking lot to the footbridge. Cross the footbridge and at the end, cross Atlantic Ave and turn right onto the sidewalk. Pass the Rocktide Motel and look for The Lobster Dock at 49 Atlantic—this place has excellent seafood and you can either bring it with you or eat there with great harbor views. Continue on past Bay Street until you arrive at the stunning white Catholic Church. Across the street is the Fisherman’s Memorial Park, a poignant reminder of the risks taken by those who “take to the sea”. This is a great spot for sunset viewing! At the corner of the church, take a left on Lobster Cove Road. Barrett Park will be coming up on your right; you will see the pavilion. Follow the shoreline here and you will be sure to find a great place to sit, read, climb rocks, swim and enjoy the view. There are picnic tables and restrooms. You can return to the cottage via Harbor Heights Road (backtrack on Lobster Cove Road and turn right), left on Bay, right on Campbell and left on High and you will come out just across Atlantic Ave from the footbridge. Go out the front door, up Granary Way, and turn right on Townsend Ave.
Go by Baker’s Way (89 Townsend Ave, (207) 633-1119—great pastries and Vietnamese food—remember to return!) and cross Union Street. Continue on Townsend to Pear Street, a sharp right in front of the Congregational Church. 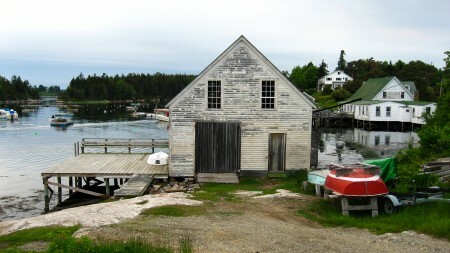 You will see one of Boothbay Harbor’s old cemeteries on the left – great for exploring. Continue until you reach Union Street and take a left. Look for Mama D’s on the left: wonderful cozy coffee shop atmosphere, breakfasts, lunches, definitely popular with the home town folks. When you’re full, go back to Union Street and turn left, then right on Atlantic Ave.
Watch for the footbridge opposite High Street. Cross it, turn right, and you’re home! Go out the front door, up Granary Way, and turn left on Townsend Ave.
At the intersection by the Library, bear right and right again at McKown Square, following the main road/Route 27 toward Southport. At the Mid-Town Motel, take a sharp left onto Sea Street. As you walk downhill, there are wonderful views of Mill Cove. Turn left onto Commercial Street by the big yellow Building #5. Now follow Commercial Street past shipyards and as you come up to the Tugboat Inn, there are fantastic views of Boothbay Harbor. Commercial Street winds its way back into town. Watch for the striped awning for Ebb Tide (see Restaurants and Coffee Shops) on your left. This restaurant–nothing fancy, just plain good – has the best fish and clam chowder we have ever eaten. See if you agree! If you keep going on Commercial St., you will be right back in the heart of the Harbor where you started–Townsend Ave will be straight ahead. SUGGESTION: combine the inner and outer loops in a figure 8 for a nice half-day outing–you’re never more than 15 minutes from the cottage! Go out the front door, up Granary Way and turn right on Townsend Ave. Follow Townsend Ave past the intersection with Eastern Ave (at The First Bank) and down the hill to the intersection with Route 96. At the intersection with Route 96, continue on Townsend Ave along the sidewalk in front of Hannaford’s supermarket for 1/10 mile then left into the parking lot for the Carrousel Theater. The trail head for Penny Lake Preserve is at the back of the parking lot, to the right of and behind the red Carrousel building. At the first trail intersection (after less than a minute), take the trail to the left, up the hill. Follow BRLT arrows down to a footbridge and cross the footbridge. At the far end of the footbridge, take an immediate right and follow the shoreline. Cross one trail intersection and stay straight along the shore. At the next trail intersection with the big boulder, go left. At the next trail intersection, go straight and up a hill. Follow the ridge up then down to St. Andrew’s Village and take a left on the road. Walk for a minute or two until you see yellow fire hydrant and a grassy path to your left with a sign that says it’s for pedestrians and bicyclists only. Take the grassy path to McCobb Road. Stay straight on McCobb Road so the red colonial house is on your right. Go up the hill to the end of the road and take a left on Middle Street (though Middle Street is not marked at that intersection). Continue on Middle Street, following signs for the hospital. Keep following the hospital signs to the right, onto Williams Road, up and over a hill to the coast. At the coast, the hospital signs point to the right but you should go left on West Street/Route 27. Follow the main road around Mill Cove. At the junction of Howard Street and West Street, stay straight on Howard Street. When you see the greenhouse on your left, turn right onto Sea Street. Sea Street curves left and goes by Dunton’s Dog House. Just after Dunton’s Dog House, take a left onto Commercial Street. This takes you back into downtown Boothbay Harbor. To get back to Back Bay Cottage, follow Commercial Street to Townsend Ave, go right on Townsend Ave then right onto Granary Way. Go 0.5 miles to the Ocean Point Road/Route 96 and turn right. Drive 3.8 miles to King Philip’s Trail (through East Boothbay). Watch for the pink and purple church on the left just before the left turn. Drive 0.3 miles to the intersection of King Philip’s Trail and Samoset Road. Park on Samoset and walk back to King Philip’s Trail, turning right. Follow the road up the hill, down to the mouth of the Damariscotta River, around the point (it becomes Samoset Road) and through the hamlet of Little River. The total distance for the loop is 1.9 miles and the scenery is breathtaking! If you want more, go back out to Route 96, turn left and continue on for 1.6 miles to a parking lot on the left – look for it just when you see the water. This is Grimes Cove. Park and walk along the Shore Road about a mile to the Ocean Point Inn and back. This is a wonderful rainy day walk when the waves pound on the shore and fog blankets the area (you may not see the lighthouses offshore on this day, but you can hear their foghorns in the distance–each one with its distinctive sound). 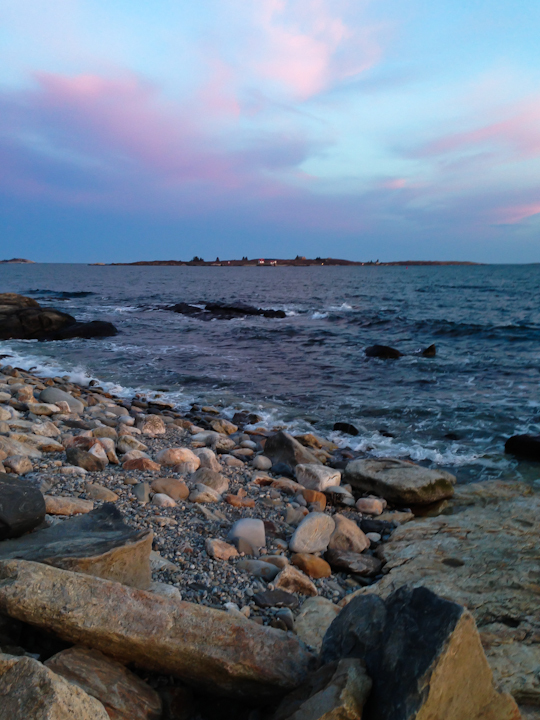 See East Boothbay/Ocean Point under “Picnics” for more details on the Ocean Point Walk. You’ve been looking at that photograph over the dining room table–this walk goes to the place I stood to take it: Cozy Harbor. Go right on Townsend Ave and take a left on Smith or Union Street up the hill and left again on Oak Street to reverse direction toward Southport. Take the first right on West Street, following the hospital signs and the shoreline. You will be on Route 27, and in about 2 miles you will cross the bridge over Townsend Gut onto Southport Island. At the intersection, stay straight on Route 27. In 2 more miles, you will see a monument. Turn left by the monument and continue on Route 27. In 0.3 miles, turn right onto Cozy Harbor Road. At the first intersection, go left onto Pratt’s Island Road. When you see the water (0.5 miles from Route 27), pull off on the right and park as soon as the road bends to the left. Turn around and you will see that familiar scene of Cozy Harbor! You can walk down the road (away from the direction you came), and cross over the bridge to Pratt’s Island to wander the dirt roads there–it’s about a half mile to the bridge and back and that is the best part of the walk. You can also walk back past your car and turn left on Cozy Harbor Road to explore that little neighborhood. On your return to Route 27, go right and follow Route 27 to Cape Newagen and onto Route 238, which comes back up the other side of Southport Island to the bridge over Townsend Gut. Turn right on Route 27 and follow it back to Boothbay Harbor. 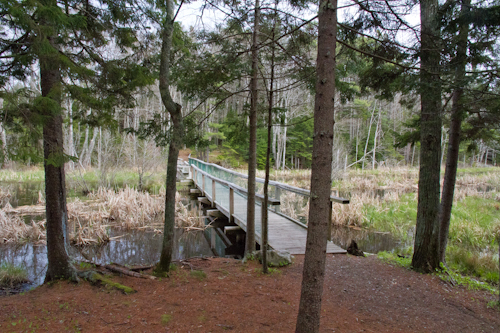 The Boothbay Regional Land Trust has a number of wonderful trails in the area. You can find their walking guide and several other guides to walking and hiking trails in the cottage. Our favorites are Porter Preserve, Oven’s Mouth and Linekin Preserve. 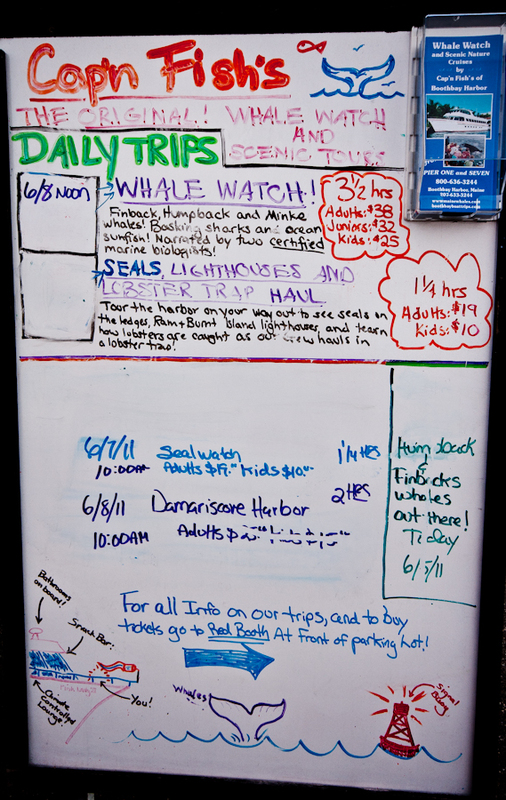 The Damariscotta River Association has wonderful trails as well, in the area just north of the Boothbay Region. Try the Salt Bay Farm loop trail and Dodge Point preserve, which is particularly nice in the fall. The neighboring town of Wiscasset has about 20 miles of walking trails. See also Picnics, Parks & Picnic Supplies for some more ideas for local walks, such as near Hendricks Head on Southport Island. Kids’ week-long summer camps—we get a reduced member rate! Check the website for details. Take a yoga class at Crow Point Yoga. Book a massage at Crow Point Yoga! Light up the stove, snuggle down and enjoy all our Maine books. We have tried to assemble a good lot to help you plan out your time here (the novels are in the twin room on the shelves!) We have an extensive collection of videos and DVDs, too, and 4 TVs. There is an activity basket for younger guests. The town Library, just up Townsend Street to the left, maintains a Used Bookstore which is chockablock full of great reads – and your purchases will benefit the Library. Sherman’s, at the beginning of Commercial Street, has a great selection of books upstairs. If you still manage to run out of reading material, the YMCA has a book swap shelf (in the Howard Gordon Lounge overlooking the racquetball courts). Go for coffee – there are dozens of places in the Harbor, but one of our favorites is Red Cup Coffee House (29 Commercial St.), especially when it's open mic nite! Take the Inner Harbor Loop walk and get coffee at Baker’s Way (89 Townsend Ave, (207) 633-1119) or Mama D’s (50 Union St., Tel. (207) 633-3464). Catch a movie at the Harbor Theater! Go either south or north on Route 1 to a world-class museum. South: the Maine Maritime Museum in Bath / North: the Farnsworth Art Museum and Wyeth Center in Rockland. Spend the day in Damariscotta with its great shops and cafes. Be sure to spend time at Renys “A Maine Adventure” department store (we never leave empty-handed), the Weatherbird (kitchen gadgets, gourmet foods, clothing & jewelry, excellent sandwiches) and the Maine Coast Book Shop. Take the River Road for a scenic drive there. To reach it, head north out of town on Townsend Ave/Route 27 for 4.6 miles and just after River End Farm, turn right. This will take you all the way into Newcastle and across the bridge into Damariscotta. Or just grab one of the ponchos from the hall closet we’ve left for you and take a good road walk. See three of our favorite rainy day walks under Other favorite walks and hiking trails: the King Philip’s Trail, Cozy Harbor or East Boothbay/Ocean Point. See Picnics, Parks & Picnic Supplies. Driving tours are the perfect thing to do if you’re exhausted from kayaking or hiking or on a rainy day. See Daytrip itineraries for a few of our favorite drives and also the book Maine’s Most Scenic Roads: 25 Routes off the Beaten Path in the den in the cottage. 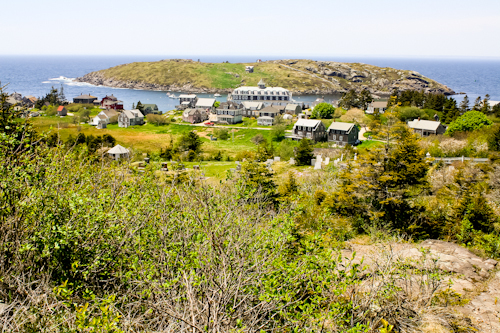 Monhegan Island is a tranquil island 12 miles off the coast with numerous walking trails, cliffs leading down to the water and classic New England cottages. For years, Monhegan has been (and it still is) a thriving artists’ colony. The island houses only a handful of shops and cafes. We highly recommend a trip to Monhegan, but best to save this excursion for a sunny day with no rough seas! 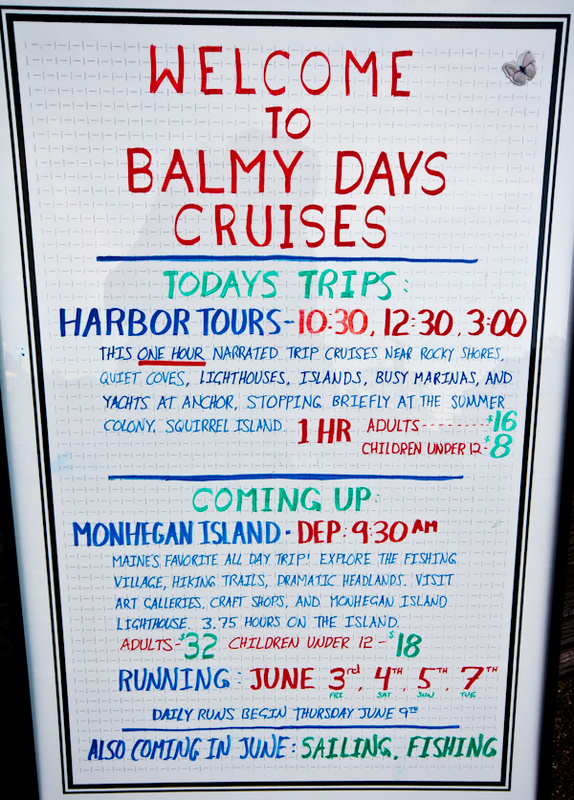 From early June to late September, the Balmy Days runs daily trips to Monhegan. The boat leaves at 9:30am from Pier 8 in Boothbay Harbor (less than a 10-minute walk from the cottage) and returns at about 4:15pm (that leaves you about 3h45 to explore the island). Burnt Island Light: We highly recommend a tour to Burnt Island Lighthouse, by boat or if you’re feeling energetic, by kayak! See History of the Boothbay Region—Burnt Island Light for more information. Cap’n Fish offers a whole slew of options including whale watches, lobster trap hauling trips, trips on the Kennebec River, boat trips to Pemaquid, trips around Boothbay Harbor and more. We would recommend in particular Cap’n Fish’s “A Little Bit O’ Maine”. We have also enjoyed the Balmy Days excursions – try the “Scenic Harbor Tour” for a great orientation to the region’s geography and history. Sometimes the best way to pick a boat trip is to just walk from pier to pier and see who’s offering what when! For those who prefer windpower to motors, there are also several schooner tours available, including the Eastwind, which also offers the possibility of private charters. 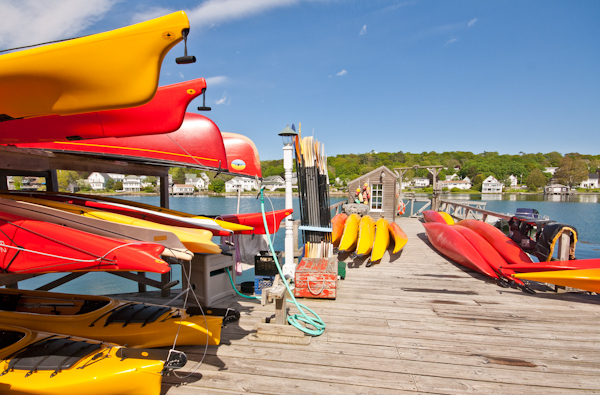 If you are looking to launch your canoe or boat and want to explore beyond the inner harbor, the Town of Boothbay has several public docks and launching ramps (including the public float is located in the middle of the footbridge, the Back River boat launch at Barter’s Island, the boat launch on Murray Hill Road in East Boothbay, the public float on Murray Hill Road and Shipbuilders Park boat launch off School St. in East Boothbay). Please see the Harbormaster’s website for more information. In addition to the ocean boat launches, you can put a kayak or canoe in at Knickerbocker Lake off Barter's Island Road. The lake is also a good spot for swimming on the warmer days, and there is also a small float in the lake to swim out to. Hendricks Head (Southport—see Picnics, Parks & Picnic Supplies for complete directions). Grimes Cove Beach (at the tip of Ocean Point, past East Boothbay on Route 96—see Picnics, Parks & Picnic Supplies for complete directions). Knickerbocker Lake off Barter's Island Road does not have a beach, but it makes a good spot for swimming, and there is also a small float in the lake to swim out to. Popham Beach State Park (Route 209 in Phippsburg). Popham Beach is about an hour’s drive (south) from Boothbay Harbor and boasts one of the nicest and longest sandy beaches in the state. Pemaquid Beach Park. About 45 minutes in the other direction is Pemaquid Beach. Combine this beach stop with a tour of the lighthouse and of Colonial Pemaquid. Reid State Park (Georgetown). Also about a 45 minutes’ drive (south). 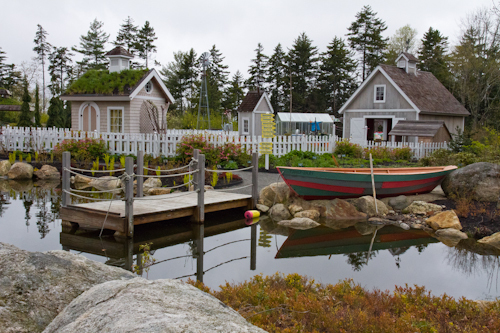 The Coastal Maine Botanical Gardens are open daily year-round and host frequent events. These 250 acres opened to the public in 2007 and are constantly expanding, with numerous gardens, waterfalls, stonework, sculptures, miles of woodland and waterfront trails, a visitor center, gift shop and café. The gardens are now listed on TripAdvisor.com as the #1 attraction in the Boothbay Region. The Botanical Gardens also has a separate children's garden on the grounds, including a tree house, activities booth and other points of interest designed specifically for the kids. The Botanical Gardens also offer Children’s and Family programs. The Maine State Aquarium makes for a fun and educational visit, especially for children. The aquarium also organizes programs for children in the summer. Boothbay Railway Village on Route 27 towards Wiscasset houses classic, vintage and antique automobiles and is a particularly fun experience for kids. We highly recommend a tour to Burnt Island Lighthouse. 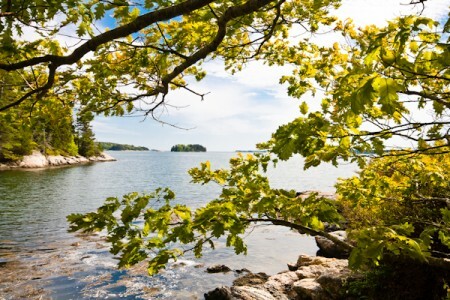 See History of the Boothbay Region—Burnt Island Lighthouse Tours for more information. For information on other lighthouses in the region, click here or here. Some of our guests have recommended Monkey C Monkey DO, an adventure park with ropes courses and zip lines, on Route 1 in Wiscasset (for GPS users, the exact address is 698 Bath Rd, Wiscasset, ME 04578, Tel. (207) 882-6861--you will probably see it on your right as you are driving to Boothbay.) Every year they seem to add new obstacles. Right in Boothbay Center is a wonderful and elaborate playground, the Harold B. Clifford Playground. See also information on the Aquarium, Railway Village and Botanical Gardens above, and below under "Courses" for more fun ideas for the kids. Dolphin Mini-Golf has 18 holes and a full-size lighthouse on 2 1/2 acres of gardens, pools and streams. There is also a covered bridge and an ice cream hut. It claims to be ranked in the top 10 for mini golf courses in the U.S.: 510 Wiscasset Rd., Boothbay, Email: play@dolphinminigolf.com, Open season phone: (207) 633-4828, Winter phone: (207) 633-2601. Open daily May 3rd 12:00pm - 6:00pm. Mid June to mid September, Open 10:00am - 10:00pm daily. Harbor Theatre: see below under "Movies". Bowling at the Bowling Bowl in Brunswick (7 Dunlap St. – Brunswick, ME 04011, Tel. 207-725-5241), now that the bowling alley in Boothbay Harbor is closed. Dunton’s Doghouse at 40 Sea St., a little hot dog stand with picnic tables out front that has become a Boothbay Harbor institution. Browsing around Enchantments (10 Boothbay House Hill Rd., Tel. 207-633-4992), a shop filled with New Age and hippie-type items: books, CDs, candles, jewelry, clothing and more. Just “hanging out” on the footbridge. The Boothbay Region YMCA (241 Rte 27, Tel. (207) 633-2855 has gym, track and pool facilities, along with numerous group classes and individual lessons available. The Y also has indoor and outdoor tennis courts. Call ahead as major renovations are planned for 2011 and certain facilities may not be available in summer 2011. In addition to the YMCA, the Boothbay Harbor Yacht Club also offers tennis clinics and allows non-members to reserve courts. The Pilates Studio of Boothbay Harbor offers both pilates (including sessions on the Cadillac and the Reformer), as well as Hatha yoga. For golf, the Boothbay Country Club is located at 33 Country Club Rd., Boothbay, ME 04537, Tel. (207) 633-6295/6085. Non-members may schedule tee-times up to 3 days in advance. Individual instruction and weekly clinics available. See also Dolphin Mini-Golf above under "For Teens". Sea Glass Spa is a recent addition to the region. If you try it, please let me know what you think! You can also book a massage with Crow Point Yoga. In season, the Spruce Point Inn has a spa. See Food & Drink – Picnics & Parks for more information on our favorite local parks. Harbor Theatre has a single-screen cinema open year-round. The Harbor Theatre is located at the junction of Routes 27 and 96, in the Meadow Mall (across from Hannaford’s). Prices are $9 for adults and $6 for children 12 & under and seniors 62 & over. Boothbay Playhouse (275 Wiscasset Road, Boothbay ME 04535) - closed for the 2015 season! 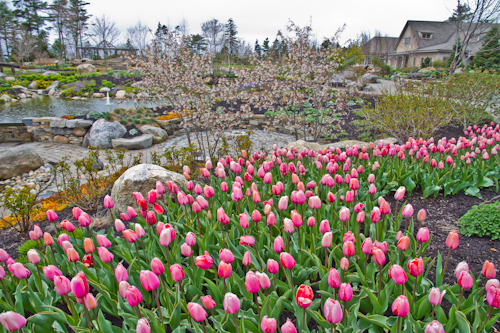 The Coastal Maine Botanical Gardens are open daily year-round and host events year-round. 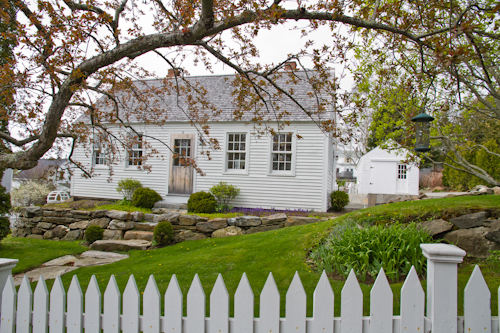 Boothbay Railway Village hosts a number of events from late May to late October. Art: The Boothbay Region Arts Foundation lists artists’ workshops open to the public. For example, local artist Mark Mellor runs a summer workshop every year. 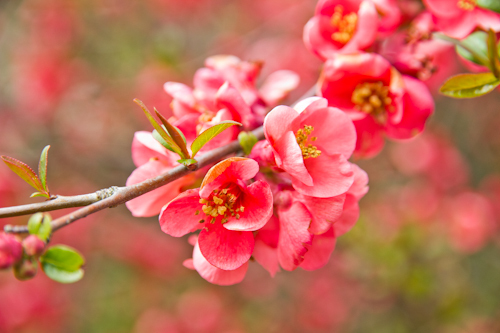 The Coastal Maine Botanical Gardens offer adult workshops and courses. Golf: The Boothbay Country Club offers individual instruction and weekly clinics even for non-members. Sailing: The Boothbay Harbor Yacht Club offers sailing courses for adults and children. For kids: The Boothbay Region YMCA offers a number of summer camps, some of which you can sign up for one week at a time. The Botanical Gardens also offer Children’s and Family programs. In the summers, Tidal Kayak right next door offers a 4-day (Monday – Thursday 8am – 12pm) kids’ kayak camp. Remember, if you mention that you are staying next door at Back Bay Cottage, they will give you 10% off! !